Επίτιμος διδάκτορας του Πανεπιστήμιου του Βοσπόρου αναγορεύθηκε ο Οικουμενικός Πατριάρχης Βαρθολομαίος, το απόγευμα της Πέμπτης 19 Δεκεμβρίου, σε ειδική τελετή που πραγματοποιήθηκε στις εγκαταστάσεις του ανώτατου πανεπιστημιακού ιδρύματος της Κωνσταντινούπολης. Αξίζει να σημειωθεί ότι η επίσημη πρόσκληση προς τον Οικουμενικό Πατριάρχη, από την πρύτανη του ιδρύματος Γκιουλάϊ Μπαρμπαρόσογλου, απεστάλη με την πραγματική του εκκλησιαστική ιδιότητα, του Οικουμενικού Πατριάρχη, δείχνοντας τελικά ότι όντως ο Βόσπορος μεταφέρει μηνύματα. Το αποψινό μήνυμα της τιμητικής διάκρισης στο πρόσωπο του Οικουμενικού Πατριάρχη ήταν από μόνο του ηχηρό. Ένα μήνυμα πως αλλάζουν οι καιροί και αναγνωρίζονται οι άοκνες προσπάθειες του κ. Βαρθολομαίου που με τις προσωπικές του δυνάμεις και τη συνδρομή των στενών συνεργατών του κληρικών και λαϊκών, περιδιαβαίνει όλον τον κόσμο, περιδιαβαίνει οικουμενικά, για να μοιραστεί με όλον τον κόσμο τις αγωνίες του Οικουμενικού Πατριαρχείου για το μέλλον αυτού του κόσμου. Και κόσμος δίχως οικολογία, δίχως χλωρίδα και πανίδα είναι άγνωστος όρος στον «πράσινο Πατριάρχη Βαρθολομαίο. Αυτήν την ευαισθησία βράβευσε απόψε η ακαδημαϊκή κοινότητα του πανεπιστημίου του Βοσπόρου. Και έτσι το μήνυμα που προσδοκούσε ο Μακαριστός Γέρων Χαλκηδόνος Μελίτων ήλθε τώρα και έτσι αναγράφηκε στο πάνελ της κρατικής αίθουσας η πραγματική εκκλησιαστική ιδιότητα του Προκαθημένου της Εκκλησίας. Στη συγκίνηση όλων μας προστέθηκε το χειροκρότημα και η δικαίωση για ένα δίκαιο αίτημα και ήλθε μάλιστα από την οικολογία που τόσο υπερασπίζεται και μάλιστα από τον Βόσπορο που τόσο προασπίζει τα όρια και τους όρους της Ρωμέικης ιστορίας μας. 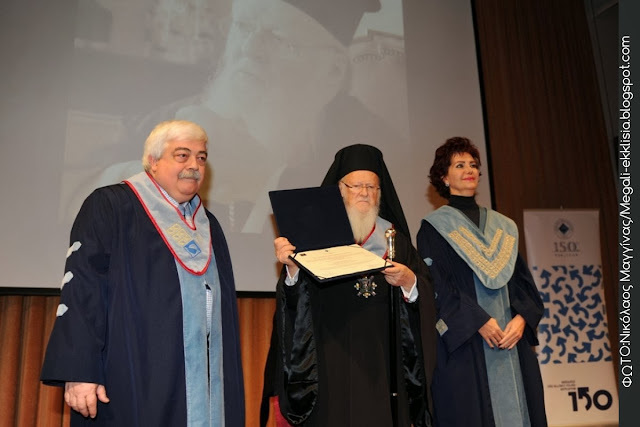 It is a unique distinction and great privilege to receive an honorary doctorate from the Institute of Environmental Sciences in this extraordinary university, with a history of one-and-a-half centuries and a reputation among the world’s most prominent centers of academic learning. 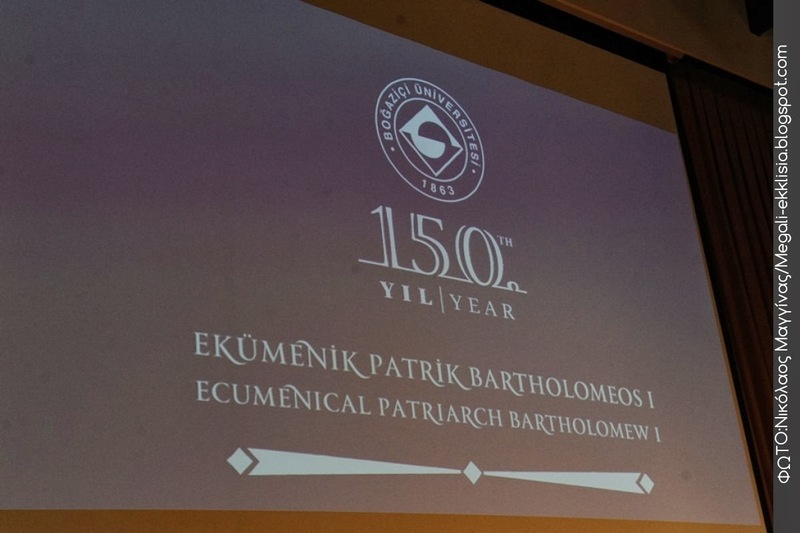 It is, moreover, especially moving to be presented this award as part of the festive celebrations for the historic 150th anniversary of Boğaziçi University. We humbly attribute this recognition to the pioneering initiatives of the Ecumenical Patriarchate, which traditionally seeks to build bridges between diverse cultures, faiths and disciplines. We express our wholehearted gratitude to the administration of this university, in particular Professor Gülay Barbarosoğlu, Rector of the university, and Professor Orhan Yenigün, Director of the Institute of Environmental Sciences, which is also the first environmental research center in Turkey. We are obliged to pay special tribute here to our venerable predecessor, the late Ecumenical Patriarch Dimitrios (1914-1991), whose private patriarchal office we directed throughout his tenure and under whose inspired leadership the Ecumenical Patriarchate designated September 1st of each year as a day of prayer for the natural environment. 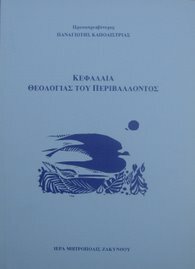 Moreover, we would like to make special mention of a former professor in the civil engineering department and director of the Institute of Environmental Sciences at this university, the late Professor Kriton Curi (1942-1996), who also contributed to our ecological seminars at Heybeliada in the mid-1990s. We regularly light a candle at his gravesite in Kadiköy. May the memory of these two men be eternal! Since our election as spiritual head o f our Church, with worldwide responsibility for the coordination and facilitation of Orthodox unity throughout the world, we have been blessed to organize five successive summer seminars (from 1994 to 1998) at the former Halki Theological School, where we focused on the interconnection between ecology and education, ethics, communication, justice, and poverty. 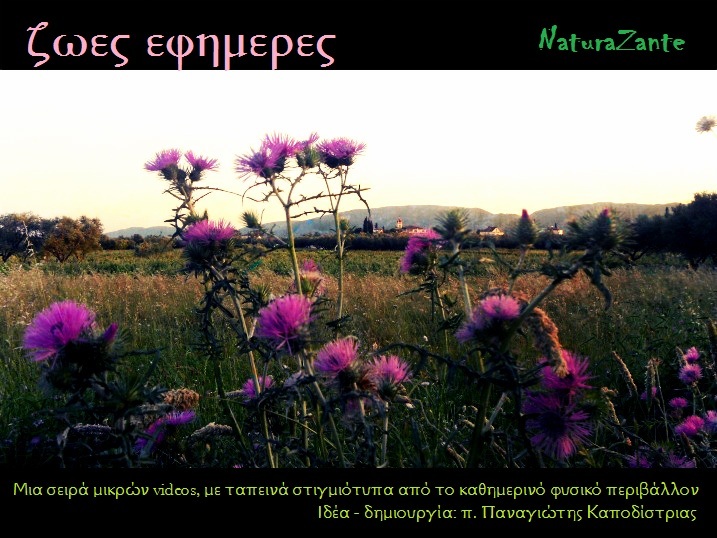 In 1993, recognizing that any proper response to the ecological crisis must occur in dialogue with other faith communities and scientific disciplines, we established the Religious and Scientific Committee, chaired by our eminent environmental theologian, the Most Reverend Metropolitan John of Pergamon. Our mission was to raise awareness on pressing ecological issues and create wider involvement in environmental matters by mobilizing the world’s religious leaders, scientists, politicians, and journalists. Thus, under the joint auspices of the European Commission, we organized eight biennial interfaith and inter-disciplinary symposia (from 1995 to 2009) to reflect on the fate of the world’s rivers and seas in the Mediterranean and Black Seas, on the Danube River and the Adriatic Sea, on the Baltic Sea and the Amazon River, as well as in the Arctic and on the great Mississippi River. More recently, in 2012, we inaugurated a series of Halki Summits to explore more specific and concentrated topics, including commerce and the arts. At first glance, it may appear strange for a religious institution or a religious leader – normally concerned with “sacred” values – to be so profoundly involved in “worldly” issues. After all, what does caring for creation have to do with salvation of the soul? It is commonly believed – although it would be more accurate to say “assumed” – that climate change and the exploitation of our planet’s natural resources are matters that primarily concern politicians, scientists or technocrats. So the preoccupation of the Orthodox Christian Church and, in particular, its highest spiritual authority, the Ecumenical Patriarchate, with the environmental crisis probably comes as a surprise to many people. Yet, we are profoundly convinced that there cannot be two ways of looking at the world; there cannot, for example, be a religious vision on the one hand, and a parallel profane worldview on the other. There can be no spiritual perspective and another, different secular understanding of the world. Indeed, in the final analysis, we cannot make a distinction between concern for human welfare and concern for ecological preservation. For the early mystics, like St. Antony of Egypt, the “father of Christian monasticism,” nature is a book, opened wide for everyone to read and learn, to savor and celebrate. Creation tells a unique story of profound mystery; it reveals an extraordinary harmony and balance, in which all people and all things are interdependent and complementary. Therefore, the way we relate to nature as God’s creation directly reflects the way we relate to God as Creator. This in turn means that the sensitivity with which we handle the natural environment clearly mirrors the sacredness that we reserve for the divine. And, by the same token, we must treat nature with the same wonder that we reserve for human beings. This is not a religious outlook; it is how the world actually is. For, what is at stake is not just our ability to live in a more or less sustainable way, but our very survival. Scientists talk of “tipping points” and “abrupt climate change.” Political leaders talk of the “challenges” that lie ahead. Religious scriptures speak of human crisis and God’s forgiving grace. All three make it clear that the time will come when we must face consequences; the time will come when it is simply too late. Scientists estimate that those most hurt by global warming in years to come will be those who can least afford it. This is why the ecological problem of pollution is invariably connected to the social problem of poverty; all ecological activity is ultimately measured and properly judged by its impact upon people, and especially its effect upon the poor. To restore the planet we need a spiritual worldview, which brings frugality and simplicity, humility and respect. We must constantly be aware of the impact of our actions on all of creation. We must direct our focus away from what we want, to what the planet needs. We must choose to care for creation; otherwise, we do not really care about anything at all. In our efforts, to contain global warming, we are ultimately admitting how prepared we are to sacrifice some of our selfish and greedy lifestyles. When will we learn to say: “Enough!”? When will we understand that we must leave a lighter footprint on this planet for the sake of future generations? After all, while we may disagree on social or political ideology, surely we can all agree on our responsibility to protect its natural resources – which are neither limitless nor negotiable – for future generations. The problem is that it takes effort to change our behavior. The Sayings of the Desert Fathers relate the story of Abba Chaeremon that, in the 4th century, he deliberately constructed his cell “ten miles from the water” so that he might struggle a little in his daily chores. Unless we are willing to sacrifice a little, then we may lead our lives without even noticing the environmental concert playing out before our very eyes and ears. In this orchestra, each minute detail plays a critical role; every trivial aspect participates in an essential way. Not a single member can be removed without the entire symphony being affected. No human being, tree or animal can be removed without the entire picture being distorted, if not destroyed. When will we stop to hear the music of this harmony? A compassionate heart burns with love for the whole of creation: for human beings, for birds, and for beasts – for all God’s creatures. It cannot hear or see any kind of suffering, even the slightest pain, inflicted on any creature. Thus, love for God, love for human beings and care for creation are not disconnected. While there may be a hierarchy of priority, it is not a sharp distinction. The truth is that we are all one family – human beings and the entire living world – and, together, all of us look to God the Creator. We remain optimistic about the human response to the ecological crisis; quite simply because we are optimistic about humanity’s potential. If we were not genuinely convinced of this, then we would be betraying our Orthodox Christian belief that even the present age – just as every age and place – must meet its obligations to the generations that follow. Never before, in the long history of our planet, has humanity found itself so “developed” that it faces the possible destruction of its own natural environment. Never before in the long history of this world have the earth’s ecosystems faced almost irreversible damage. It may be that future generations will some day view the senseless eradication of the magnificent repositories of genetic biodiversity in our age in much the same way as we view, in retrospect, the burning of the library in Alexandria in 48 B.C. This is precisely why our most recent and responsible vision with regard to creation care is the establishment of the Rum Orphanage in Büyükada (Prinkipos, the largest of the Princes’ islands in the Sea of Marmara) as the home of the World Environment Institute. This pioneering project will be the center of an interdisciplinary and interfaith initiative, which will serve as a catalyst for assembling leaders in religion, science, business, civil society, government, and academia. The Ecumenical Patriarchate has already decided to proceed with the creation of the appropriate Foundation for this purpose, which will commence with the restoration of the historic and magnificent wooden orphanage, for which we have the pledged support of prestigious companies and individuals. We owe this to our region and to the world. Distinguished colleagues and dear friends, the natural environment belongs not only to the present generation but also to future generations. Our children and our children’s children are entitled to a world free from degradation, violence and bloodshed, a world of generosity and compassion. And in this sacred goal, we derive encouragement and inspiration from the youth – from the bright and promising students of your own institution, Boğaziçi University, to which we remain grateful for this exceptional award and the invitation to address you this evening.